During the first few months after the death of the Roman emperor, Constantine I (the Great), his three sons – Constantine II, Constantius II and Constans – conspired to purge most the remaining members of their family and consolidate their power. They murdered their half-cousins – Hanniballianus and Delmatius – as Constantine I had elevated them to Caesar along with his three sons, and on September 9, 337 AD, the three jointly claimed the title of Augustus. Constantine II took the territories in the West (Gaul, Britain, Spain and the westernmost part of North Africa). Constantius II ruled over Asia Minor, and annexed Pontus and Armenia that were led by Hanniballianus. Constans, the youngest of the three brothers, controlled Italy and Illyria, and took over the Balkan territories previously under Delmatius. The very inequitable division of the empire immediately caused tensions, and Constantine II demanded Constans give him Italy and North Africa. Constans refused. In 340, Constantine II declared war on him, but was killed in battle soon after the conflict began. What started out as six joint rulers under Constantine I (including Constantine’s eldest son, Crispus, who was wrongfully put to death in 326), was now left to only two – Constans ruling all of the West, with the East still under Constantius II. Constantine II AE15 from Rome mint, 337-340 A.D. RIC. VIII 14. VIRTVS AVGVSTI. R leaf P.
CONSTANS, 337-350 AD. 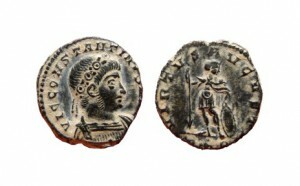 (AV Solidus 20.2mm 4.3g 6h) Siscia Mint. Struck 340-350 AD.